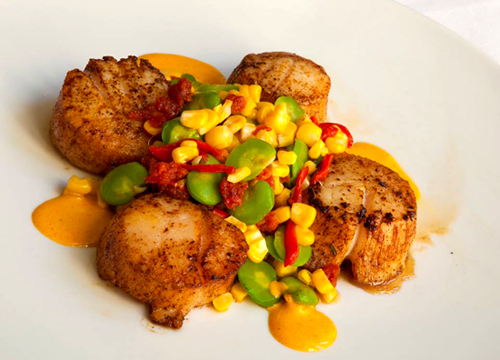 Catalan Mediterranean Cuisine Restaurant located on Hwy 111 in Rancho Mirage is presenting a Six Course Tasting Menu where each course will be paired with a premium wine from the world famous Caymus Vineyards. That’s quite a mouthful and it sounds like there will be many! A Six Course dinner is an event in itself. And here the valley gets to relish in the gastronomical artistry of Executive Chef Drew Davis as he pairs his meals to an array of wines from Caymus. 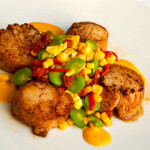 The foodies in our area already know the talents of Chef Davis as the restaurant has been around for almost two years. He’s been on point with the restaurant’s theme cookery of Spanish/Italian Mediterranean. 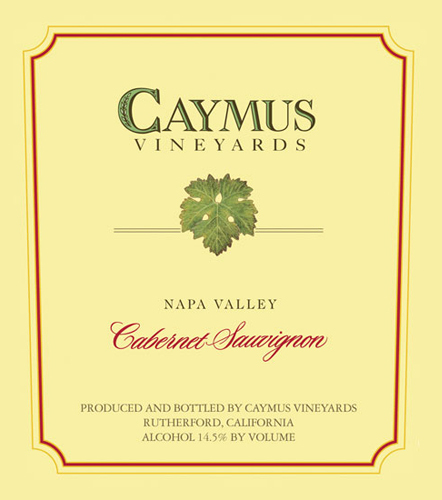 Chef Davis is reveling in the opportunity to use the versatile California wine palate of the Caymus Wines to perfect an evening of highlighting meals and courses from all over the map. I spoke with Chef Davis on his ideas of pairing the six courses: After requesting the Caymus Representative to bring by a dozen or so bottles from their portfolio—and tasting through them! Chef and the Rep decided on the wines for the evening. Two Chardonnays will be featured: The Mer Soleil Silver is un-oaked; “It’s a nice crisp, clean, and refreshing white that will work perfectly with the First Course, Octopus & Diver Scallop Carpaccio. There will be a great contrast of flavors—sweet, salty, and spicy, and will definitely get the dinner party going with the Squid Ink Crème Fraiche, Micro Cilantro, Fresno Chili, Smoked Sea Salt and Orange Zest. For the second course, the Mer Soleil Reserve is the barrel fermented version and medium-bodied full blown California style Chardonnay with layers of tropical fruit and hints of butter and toasted almond. Bring on the Grilled Maine Lobster Tail with Olive Oil Poached Heirloom Tomatoes, Garlic, Capers, Anchovy, and Oregano. Chef says this will be a rich and garlicky creation that will satisfy anyone’s fix for the celebrated Maine lobster. The Third Course matches one of Caymus’s flagship wines, Meiomi (may-oh-mee) Pinot Noir, to Crispy Lamb Belly with Duck Fat Winter Root Vegetable Hash, with Saba—a syrup made from fresh grape juice along with an Orange Marmalade. Meiomi is a high style Pinot Noir that is shaped, more than anything else, by the fruit sources that lay the foundation of the blend. This Meiomi blend of California’s most noteworthy coastal Pinot Noir vineyards makes for a dynamic and opulent wine that will well complement the crispy lamb belly and lively hash. With a deep, rich garnet color, the wine opens up with aromas of ripe berries, fresh cranberry, candied apple and malted vanilla, some of which carries through to the palate. 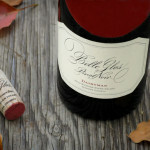 It is an extremely layered wine, both in structure and flavor, displaying freshness and maturity all at the same time. For the Fourth Course, Chef gets inventive by preparing a Braised Rabbit Ragu with Caymus’ Cabernet Sauvignon along with a Kalamata Olive Polenta, while serving a single-vineyard Pinot Noir—the Belle Glos Las Alturas. As the Belle Glos suggests, term “Las Alturas” means “the heights”, which is a fitting name for this vineyard, it’s located on one of the highest grape-growing “benches” within the Santa Lucia Highlands AVA. The area benefits from the cooling effect of the early morning fog that rolls in most days from Monterey Bay. This translates to a wine that is dense, a concentrated ruby color, hinting at the dark berry fruits and rich, textural components. On the nose, aromas of raspberry, wild blackberry and a slight earthiness with a supple palate layered with exotic spices, a rich meatiness, ripe plum, currant and black cherry flavors. The ripe tannins are nicely balanced with acidity, and the finish is long and fulfilling. It’s the perfect pairing to the hearty flavor of the game meat and is the classic Mediterranean endeavor atop the Kalamata olive polenta. Yum! Incredibly—there is still the Main Course to enjoy! 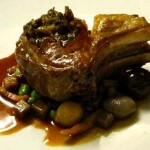 The famed Caymus Napa Valley Cabernet Sauvignon will meet its heavenly match of Chef’s Pan Roasted Australian Rack of Lamb along with Braised Winter Beans, Tuscan Kale, Serrano Ham, Cipollini Onions, in a Port reduction. This definitive Bordeaux-type pairing of Lamb and the Cabernet Sauvignon will probably put this wine dinner on our winter’s culinary map. 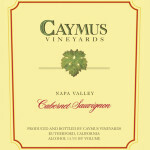 This world famous Caymus Cab, which Wine Spectator magazine has scored 90+ points continuously for the past 40 years! has a dark, scarlet red color, with powerful aromas of sweet ripe Cabernet grapes while the whole of the wine is balanced, rich, expressive, and impressively complex. 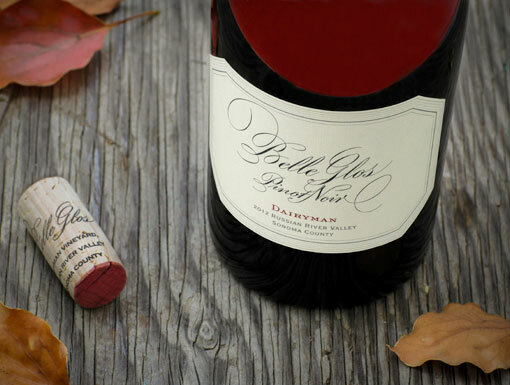 This wine has always been a blend from eight of the most desired appellations in Napa Valley. And supposing we still have room for dessert, Caymus’s Mer Soleil Winery puts out a Late-Harvest Viognier [vee-oh-NYAY] that is a concentrated, nectar-like dessert wine produced only in certain harvests under moisture-filled weather conditions. Viognier is already a highly aromatic wine so when a late-harvest version comes out, we’ve got intense flavors of apricots, flowers, peaches, and honeysuckle swirling around. Here, look to Chef Drew’s sweet finale of a Chocolate Terrine & Sea Salt Almond Bark to play with the liquid-gold brew of peaches and apricots. Bon Appétit! & Cheers! See you there!